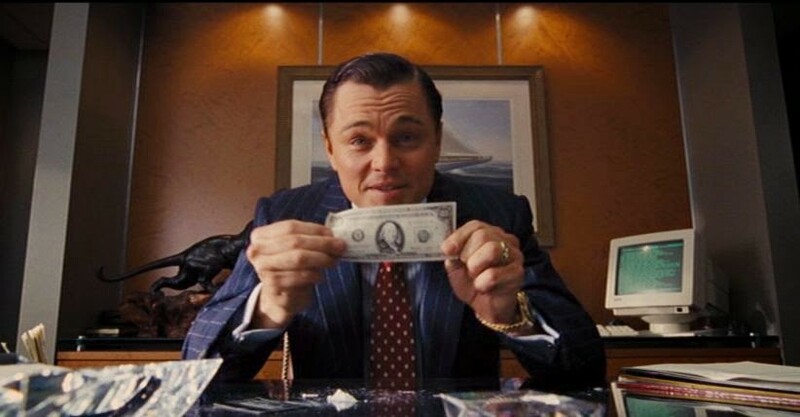 One thing that has not been mentioned about the entire QuadrigaCX situation is the fact that its internal cash operations mirror several aspects of the movie, ‘Wolf of Wall Street’. What is the ‘Wolf of Wall Street’? If you have never heard of this movie, then its time for you to finally escape from under the rock that you’ve been living under. 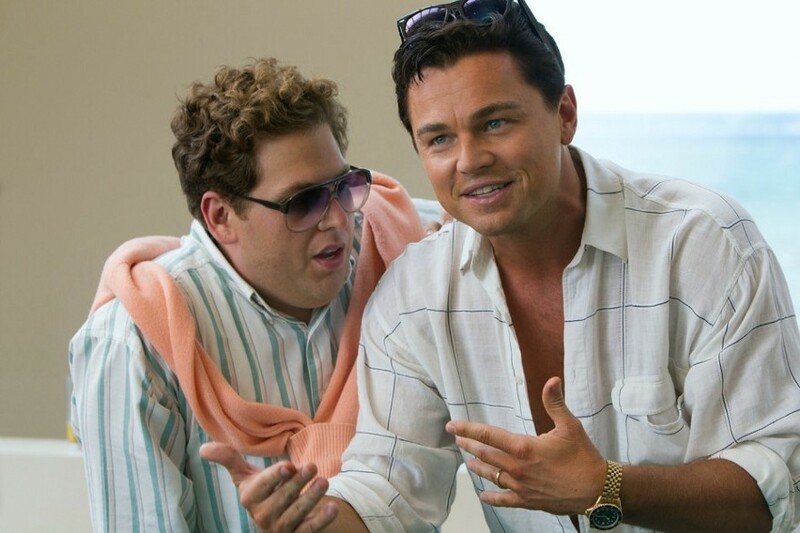 The movie is based on the life of Jordan Belfort and features both Leonardo DiCaprio and Jonah Hill. The Greater Fools Theory is an idea Belfort himself profited from at Stratton Oakmont. And he’s not the only one who sees bitcoin in this light. Billionaires Bill Gates and Warren Buffet have similarly criticized bitcoin. “As an asset class, you’re not producing anything and so you shouldn’t expect it to go up. As mentioned above, the movie was based (loosely) on the life of Jordan Belfort, a former stock broker that defrauded investors out of an excess of $100 million. He was eventually incarcerated for his crimes and ordered to pay restitution once released. While his scheme was going on, Jordan Belfort lived a life of excess and luxury, flaunting his ill-gotten gains for all to see. Without getting bogged down too much with explaining the entire plot of the movie itself or Jordan Belfort’s background, we’re just going to focus on certain, specific details that run parallel to QuadrigaCX’s cash operation. Thus, the purpose of this piece is to detail the scheme that Jordan Belfort ran to defraud investors and detail the many similarities between this scheme and what it appears Gerry Cotten was doing at QuadrigaCX. In a nutshell, Jordan Belfort was taking companies (which were worthless most of the time) public via an IPO (the stock market version of an ICO). His company was usually heavily invested in the company that he was taking public. Employees at Jordan Belfort’s firm were tasked with the responsibility for contacting HNWIs (high net worth individuals) around the world to entice them to buy into these penny stocks. Employees were encouraged to vastly overstate the profit potential and viability of these companies. Of course, after they were able to successfully create enough hype and lure enough investors to drive up the price of the stock, they would subsequently ‘dump’ on all of their investors. There is not a movie clip (unfortunate, yes) available that describes this exact process, but fortunately, the author remembers exactly how it worked and there are other resources on the internet that describe this process as well. What essentially allowed and assisted Jordan Belfort (Leonardo DiCaprio in the movie) in avoiding greater scrutiny from law enforcement for as long as he did was the use of ‘ratholes’. These were the individuals that assisted Jordan Belfort in concealing the proceeds from the P&D operations that his firm (Stratton-Oakmont) was running. Since the practice of P&D practice was highly illegal (as Leo explained in the previous clip), he had individuals that were entirely separate from his brokerage (Stratton-Oakmont) purchase large allocations in the companies that he was planning to take public. Of course, once those companies went public and the price appreciated by a certain %, Jordan Belfort would instruct his ‘ratholes’ to ‘dump’ the stock on unsuspecting investors. Once this phase of the operation was complete, the rathole would then cash out the proceeds from the dumped stock. However, this was not the end of the rathole’s responsibility because Jordan Belfort also needed a way to store this illegal money. Obviously, he could not simply place it in a bank account under his name or brokerage because the money had no legitimate legal source and thus, would immediately draw intense legal scrutiny. So, Jordan Belfort acquired an account with a Swiss bank, then had his ‘ratholes’ fly the money (they literally took cash through the airports) directly to Switzerland to deposit it in Belfort’s account. Obviously the above scene is a Hollywood-version of what the reality was, but it essentially shows how Jordan Belfort and his business partner developed strategies for funneling money over to Switzerland without being detected. As mentioned above, they were forced to use cash to facilitate this illicit export of money from the United States in order to avoid leaving a ‘paper trail’. How Does Any of This Relate to QuadrigaCX? Let’s bring this whole article back full center and explore then numerous parallels between Jordan Belfort’s activities and that of Gerry Cotten. The last Court Monitor report was released on March 1st, 2019. In this report, the Court Monitor made several revelations about the internal processes of QuadrigaCX. In specific, however, we’re going to focus on one revelation they made with regards to the ‘fake trading accounts’ that were created and used at QuadrigaCX. There were at least 14 accounts that were created and used specifically by QuadrigaCX on their exchange. They essentially functioned as quasi-customer accounts. There is no reason given in the Monitor’s report for why QuadrigaCX did this. 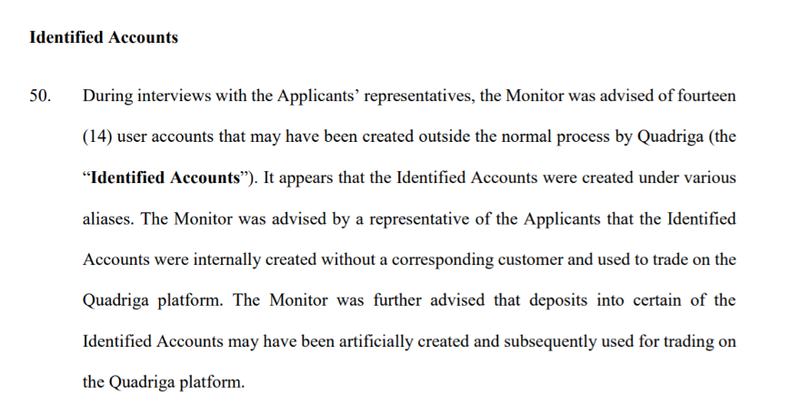 According to the Monitor, these accounts were responsible for a substantial amount of volume on the platform. When comparing the information provided above to Jordan Belfort’s ‘rathole’ scheme at Stratton-Oakmont, the similarities become readily apparent. On March 15th, 2019, a former employee at QuadrigaCX, named Aaron released a transcript of his correspondences with Gerry Cotten, spanning from approximately September 2018 to December 9th, 2018 (the day of Gerry Cotten’s death). Specifically, there are a few things in the transcript that are worth noting. 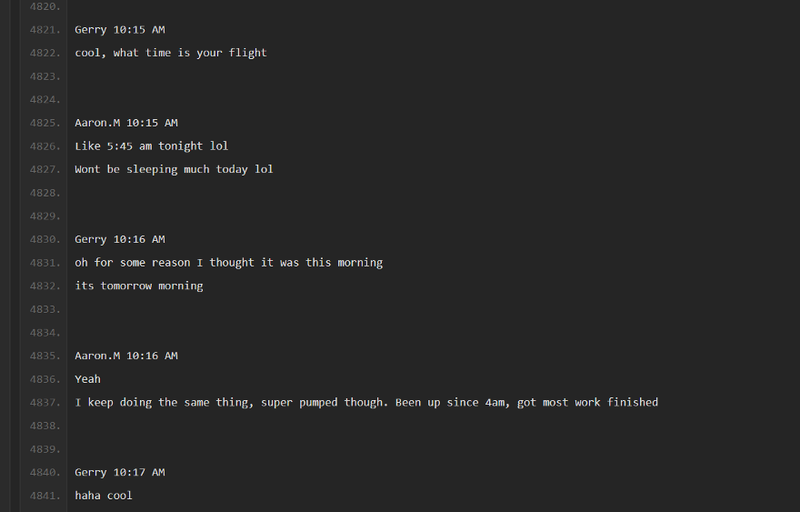 First, we’re going to look at the excerpts in the transcript regarding Aaron’s trip to the Dominican Republic. 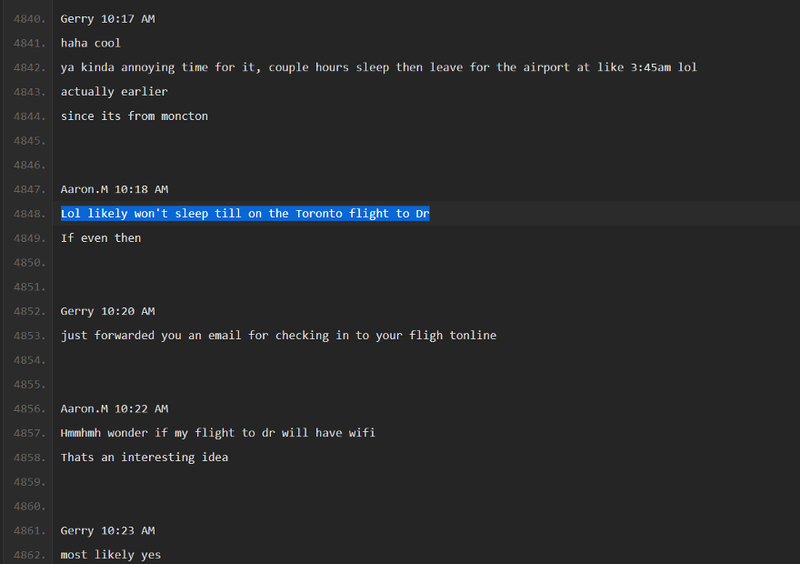 Although not stated explicitly in the above screenshot, Aaron mentions a trip to ‘Dr’. This is a common abbreviation for the Dominican Republic. There is no other country with these initials that would logically fit into this context (i.e., that one could reasonably expect to take a flight to from a Toronto airport). 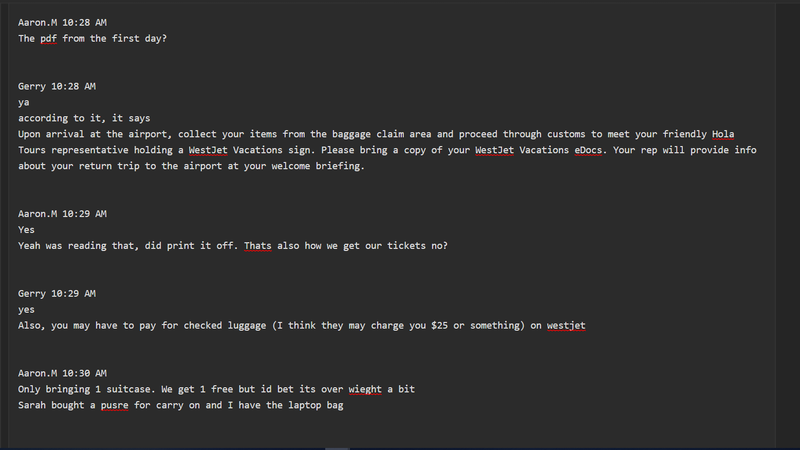 In particular, ‘WestJet Vacations’ is mentioned a little further along into the dialogue. 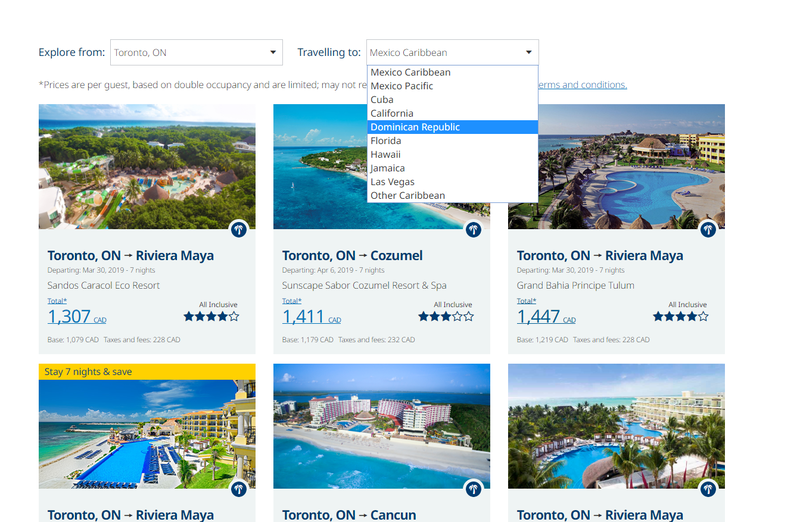 Upon visiting the website, one can view at all of the available vacation destinations out of Toronto, Canada (where Aaron noted that he was leaving from). In the picture above, we can see that there are only 9 primary listed vacation destinations. The Dominican Republic is one of them, which confirms are earlier presupposition that Aaron was flying to the Dominican Republic. In the messages following the ones shown above, Aaron expresses a considerable level of paranoia about having his bags and electronic devices searched by airport security. 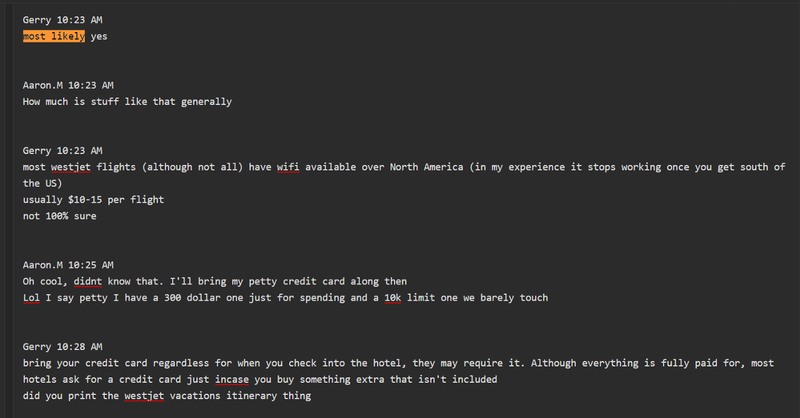 He admits to scrubbing his devices before boarding any of the flights and also mentions that he has cash (bank drafts) with him, making it clear that his purpose for traveling is essentially to act as a mule for Gerry Cotten (or a rathole). One day, he was on his honeymoon, enjoying the opulence of Jaipur. Twenty-four hours later, he was dead in mysterious circumstances – taking valuable secrets and cryptocurrency passwords with him to the grave. Now, his demise has left his company and industry in turmoil. The article covers the final few hours of Gerry’s life and confirms that he did indeed pass away in India. 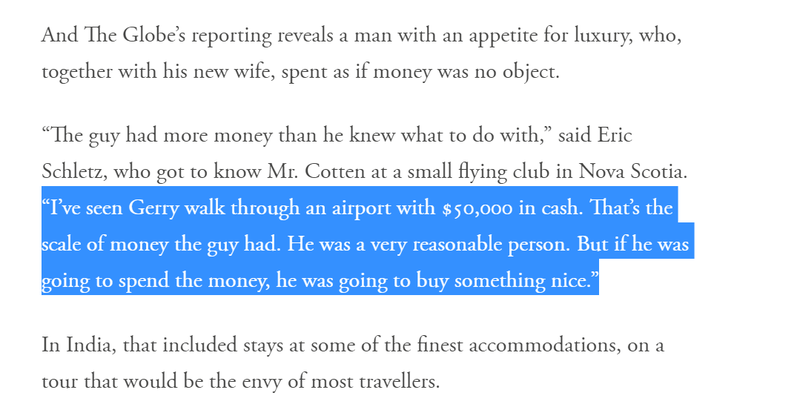 Its worth noting that the above quote is highly contradictory in its assertion that Gerry Cotten was known to carry up to $50,000 in cash on him while praising him for being a ‘reasonable’ person. Few would consider carrying this much in cash to be ‘reasonable’. Its worth noting that the ‘Globe and Mail’ positions this statement as a testament to Gerry’s alleged habit of perpetually flashing his wealth. But can we be sure that this is/was the case? Carrying this amount of money through an airport is highly unusual and chances are that Gerry Cotten was not simply carrying money through the airport to ‘show-off’ (remember this was a private individual that possessed absolutely no social media). There is a solid possibility that Gerry Cotten had that much cash on him to deposit it into a foreign bank account (as he had instructed Aaron to do). This is pretty reminiscent of that scene from the movie, ‘Wolf of Wall Street’, linked above, where the characters were discussing the best ways to transport vast amounts of money through the U.S. airport to Switzerland. Another thoughtful piece written on QuadrigaCX/Gerry’s cash habits was published on February 19th, 2019, in the Wall Street Journal by Paul Vigna. An unusual cash-pickup system is the latest unusual business practice at Quadriga to emerge since Gerald Cotten, the firm’s 30-year-old co-founder and CEO, died in India late last year. In specific, the article covers the fact that customers were instructed to pick up cash at various destinations around Canada. The article interviews a couple of confirmed QuadrigaCX customers, whom provided their names to be included on the ‘record’. These customers noted that they sometimes had to drive several hours to various (seemingly random) locations in Canada in order to obtain cash they were owed by the QuadrigaCX exchange. Some customers that were quoted in the article noted that they were given locations to visit to obtain their money and upon arrival, discovered that the location was either closed or an individual that ran a business of some sort at the designated location refused to honor the customer’s attempt to obtain funds. The latter two options became the preferred vehicles of choice for obtaining liquid capital as Billerfy and Crypto Capital Co. became increasingly unreliable in the final weeks of QuadrigaCX’s operation (and Gerry Cotten’s life). Thus, in order to sustain the exchange, Gerry and Aaron spent the majority of their time coordinating with one another to figure out a way to receive money from customers looking to deposit on the exchange so that they could then use those same funds to satisfy overdue customer withdrawal requests. This is fairly evident through explicit statements made by both Gerry and Aaron in the leaked transcript. So Why Was Aaron Flying Money to the Dominican Republic? This is where things get weird because, at no point in time do we see Gerry or Aaron indicate that they were using any sort of banking in the Dominican Republic as a means of withdrawing or depositing customer funds. So this begs the question of why Aaron was flying funds there. Additionally, the author has received information from numerous reliable sources (that prefer to remain unnamed) that there were several individuals carrying large amounts of cash through airports at Gerry Cotten’s behest. One glaring issue that has been widely ignored in the QuadrigaCX case is the fact that a lot of the numbers simply do not add up. While there remains substantial riff-raff in the community regarding the legitimacy of claims that QuadrigaCX sent over hundreds of thousands of Ethereum to outside exchanges, one thing that is certain are identities of QuadrigaCX’s Bitcoin ‘cold wallets’ (this was identified by the Court Monitor). As noted in the Court Monitor report, these addresses currently only contain a few hundred thousand dollars worth of bitcoins in them. This pales in comparison to the total amount of bitcoins that have flowed through them, which totals approximately $400 million worth in bitcoins (at the time of transfer). Zerononcense conducted a thorough analysis of these wallets. Despite $400 million worth of bitcoins that are unaccounted for, it appears that hardly any of that money has been found at exchanges. Based on the Court Monitor’s most recent report, it can be stated with confidence that the Court Monitor reached out to various exchanges, and only a few confirmed that they still had funds belonging to QuadrigaCX/Gerry Cotten. The $400 million that went through those wallets did not simply disappear. In the last few weeks of Gerry Cotten’s life, QuadrigaCX was running an extreme fractional reserve. Gerry Cotten was relying on additional customer deposits (fiat) to satisfy pending customer withdrawals. Gerry Cotten had individuals funneling money to several different foreign jurisdictions. Yet, for some reason, Gerry did not tap into these reserves in order to satisfy customer requests. If QuadrigaCX really did (or does) possess $190 million in cryptocurrency in reserves, why did Gerry not tap into those reserves in order to satisfy customer withdrawal requests? He was already effectively operating a ponzi by using customer deposits to satisfy customer withdrawals. At the very least, if he had liquidated down some of this cryptocurrency, this would have allowed him to satisfy all outstanding fiat withdrawal requests without compromising the exchange’s reliability in the manner that he did. Given what we now know about QuadrigaCX and Gerry Cotten’s practices, it is not entirely impossible that Gerry has a large store of cash that is currently unknown to both the Court Monitor and other interested parties in the case. Thus, those that have facilitated the deposit of various amounts of money on Gerry Cotten’s behalf should be required to give testimony regarding what they did with this money because they could be complicit in a massive money laundering/wire fraud/ponzi scheme. Edits (March 21st, 2019): This report has been edited to remove the name of an individual that was erroneously cited in connection with Gerry Cotten’s export of fiat currency from Canada.